Here we are sharing Top 3 Free Mass Ping URL Website 2018 For Fast Indexing Your Website To Google, Bing and Others Search Engines these websites are totally free of use but you can buy their paid services too with fast indexing feature. 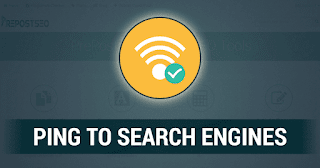 This Website is Totally free For PING Your URL by Search Engines you Can Also Use up To 5 Keyword for your URL which can ping with URL for Search Engines. How This Works PingFarm is a service which notifies Search Engines that your blog or website has been updated. This Website Ping your url to 24 website including google, Bing, yahoo and weblogs etc you can upload your text file to this website which is very good feature for mass or you can call bulk URL ping. Free mass ping tool help to Google for find new content and backlinks. Have you added a new page, written some new content or new backlinks for your website? Instantly bring Google and 50 other services to your URLs, to quickly get that content indexed or updated. Now you don't wait for ever, for the next visit from their web crawler! This Website also Provided Various Services Included Whois Checker and Website Value Checker.